Nissan of Richmond is a Richmond Nissan Dealership located at 11401 W Broad St, Richmond, VA 23233. Our new Nissan line-up includes: Nissan 370Z, Nissan Altima, Nissan Armada, Nissan Frontier, Nissan JUKE, Nissan Leaf, Nissan Maxima, Nissan Murano, Nissan NV200, Nissan Pathfinder, Nissan Quest, Nissan Rogue, Nissan Rogue Select, Nissan Sentra, Nissan Titan, Nissan Versa, Nissan Versa Note, and Nissan Xterra. We buy and sell quality used cars including certified pre-owned Nisan. Nissan of Richmond sells Nissan parts and accessories with a large in-stock selection. Need car service or auto repair in Richmond? Our Service Center offers automotive repair and maintenance for all Nissan models. We proudly serve the Norfolk, Newport News, Midlothian, Chester, Williamsburg, Powhatan, Petersburg, Harrisonburg, Charlottesville, Milford, Mechanicsville, VCU, Henrico, Chester, Petersburg, Midlothian, Bellwood, Highland Springs, Sandston and Lynchburg, Virginia areas as well as Washington DC, Maryland. 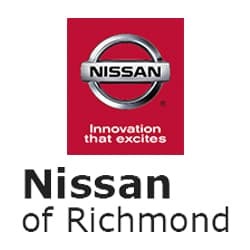 Contact our Richmond Nissan dealership today to learn about all that Richmond has to offer, like the newest breweries in Richmond and longtime favorite Richmond restaurants.